I have the memories of how unbelievable it was to be chosen by Chewie as his new caregiver or as he thought of me “chosen as his girlfriend” at the same time he was choosing to leave the mom who had raised and cared for him. She had nursed him back to health from a tiny newborn infant, and had loved him and taught him so many amazing things throughout his eleven year life with her. Their life together was totally wrapped in love for each other, but it changed unexpectedly. I had watched her go through unbelievable things with him. At least they were unbelievable to me, as she was raising him. He had such an attitude from the very beginning and truly possessed a mind of his own. I remember never wishing to build a relationship with him because to me he looked somewhat like a mouse or a rat all rolled into one, and seeing the way he could have family members running from the room as she was saying, “Cover your ears. Run and close the door!” He loved to show his anger and dominance often to her teenage children in a very unique way and that was chomping down on their ears and holding on for a long period of time. During the last half of his life he was living a very different type of life with me. I guess he knew he had to live differently now that he had me. It was amazing how connected that we became. 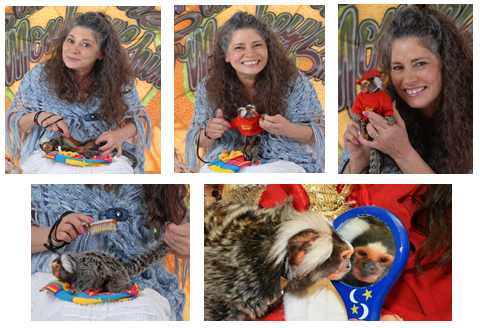 For you readers who are not aware of certain aspects of a marmoset’s life experience, I wanted to explain more about becoming a human girlfriend (which is similar to being a mate for a marmoset) as I have mentioned earlier. Marmosets mate for life. They leave their parents care as they mature and then they begin to look for a mate. The previous owner of Chewie and myself both felt that this was part of what was happening to him emotionally as he was choosing to leave her and come to me. I must say that this change that he made from his previous owner to me was a very hard issue for us both to live with, but when we were able to look at it and understand what was happening to him, it became much easier for us to accept it. One of the special gifts of primates is their ability to be very advanced in their emotional growth process in comparison to other animals. 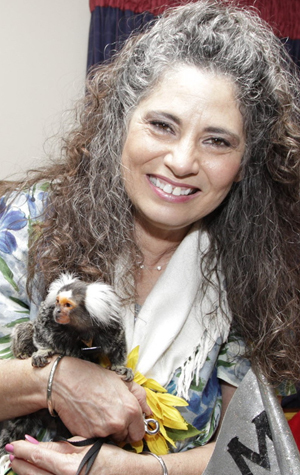 Marmosets are truly amazing creatures of God. You can actually see them think, plot, and execute so many of the same behaviors that you will see in larger primates. My experience with Chewie was my only experience with a marmoset, but from the first moment of him becoming my monkey he let it be known to my husband. Any other male visitors was not allowed to touch or engage with me in any way. He showed similar emotional behaviors with me that he would have shown to a chosen marmoset mate. Major change was also a part of Chewie’s life during this period of time when he chose to make his life change to my life. The previous owner’s family lost their home during a hurricane and had also prior to the hurricane added two night time friends that were Sugar Gliders into their life. So there were several major life-changing occurrences going on in their life at the time of his emotional turn towards me. 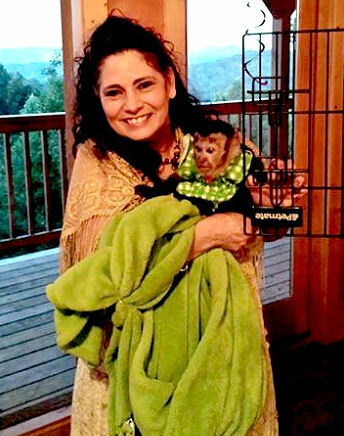 It is my opinion that when families are going through major changes in their lives that this can cause many behavior changes with their monkey. These types of changes can bring about monkeys choosing to change their allegiance to a different person too. I have many shocking stories about this type of behavior happening. It is heartbreaking when it happens to families with monkeys. The emotional mindset of a monkey is very amazing, nothing shocks me anymore when I hear these types of stories. I do feel that proper programming of monkeys when they are young can be very helpful as a monkey is growing and changing emotionally throughout their lives. I wrote the “Living With Monkeys” The Baby Book to try to impress upon people to take the job of being a monkey caregiver very seriously. Education is one very important tool to pull from when raising a monkey, but being able to be firm and consistent with a monkey is even more important. Once a monkey is programmed improperly it is very hard to reverse their behaviors, but I am a positive person and I do not like to give up on a monkey being able to make changes for the better. The turn of events in both of our lives was very unexpected. I loved and enjoyed having Chewie with me every day. Oh how I wish I had more photos, but when I think about it, more photos are really not necessary due to him being forever in my heart and mind. I know without a doubt that I will always remember all of our wonderful times together. 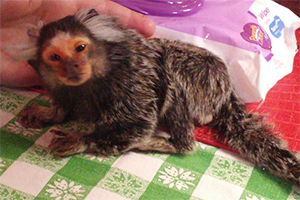 In December, four years ago, I was asked to give a home to another girl capuchin monkey. Many of the past post that I have written this year have had stories written about this little monkey named Opie. As Opie was getting used to being in a troop of monkeys instead of being a single housed monkey, she was also bonding with Chewie because he was located right next to her enclosure. I could tell that they were learning how to communicate with each other and that something very magical was happening between the two of them. The first strange thing that I noticed was that when the other monkeys were getting upset, Opie would go over to the side of Chewie’s cage and would begin to get very vocal with them, which showed me that he was siding with her in the battle that was going on with the troop. Then I started realizing that they were both hanging out together. He was pushed up close to his side of the cage where she was closest to him and she was doing the same thing in her cage. As time passed, I began to allow Chewie to go into her large cage and let him have short grooming times. He was so little but she was always very gentle with him as she groomed him. Of course, now I understand what was happening with their relationship and how important that it was for the two of them at that time. Opie had definitely become Chewie’s very special monkey friend. 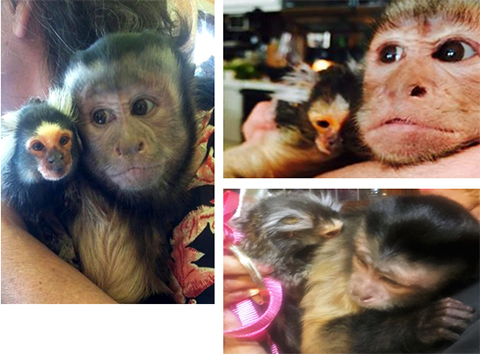 After several months it was time for Opie to be introduced to the rest of the Capuchin monkeys. 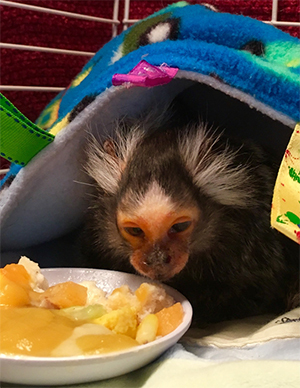 I was so happy that she and Sophie, one of my other single housed monkeys, began enjoying spending time together in the other monkey area of my home. Chewie continued to have time to visit with Opie often before he started to have limited mobility due to his advanced aging problems. I hope you enjoy seeing the photos of them together. He passed away three days after the last photo shown of them together. Chewie’s aging process was very much like many older aging human seniors. He turned 20 years old on April 25. 2016, and his physical and emotional place at that time made me think that he just might make it several more years. He was running over to greet me from the back of the cage when I came to his cage and he was even whistling to me many times during the day. He was able to see with his right eye and had some really great days even though he had arthritis in his knees and hip joints. When I looked at him, his eyes were bright and he still had a medium amount of twinkle in those eyes of his, especially when he knew I was bringing him his food. The only thing that was still happening that I felt challenged with, was that he did not like to be pick up at any time. This of course, meant that he did not wish to come out of the cage for his “bath” time or his “brush you” time. Three months after his 20th birthday, at the end of April, I noticed that he was having a tremendous amount of liquid running from his right eye. The veterinarian felt that it was a tumor behind the eye that had taken the vision away from him. I told the veterinarian that I felt that it was time for me to have pain medicine available for Chewie with his diagnoses, and he agreed. It was not said, but we both knew that this visit would probably be the last time Chewie would be visiting him. Total blindness for Chewie was the final thing that he did not wish to adapt to. He was depressed, could not hear well, and was now only seeing light and shadows. He did not move as he had been able to do before the total blindness happened. He was completely out of his comfort zone now, and I was not the only one who could see it. He would not roll over or move out of the spot that he had used the bathroom in, and he was really not happy about any of the changes he was experiencing. With his blindness and also becoming almost deaf, I knew his condition was deteriorating and I felt that I was not going to be able to turn his emotional issues around with all of these things happening at one time . This is when I made my decision to make changes to accommodate his life. I made a drying cage for him to rest in after his frequent exercising baths. I checked in on him twice as much as I had done before and spent extra time exercising his little legs up and down in the warm water in my sink with the heater right next to him. He must have looked forward to this new ritual because he stopped being so ugly when I picked him up to move him from his cage. 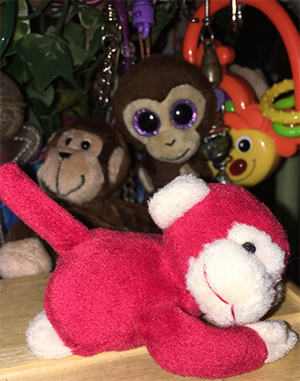 When he was little, he loved to fight with his little toy that was named his “Nuby.” This tiny stuffed toy gave him a place to work out his issues of anger and lack of control while he was in his cage or out with his former owner. He seemed to love his “Nuby” with great emotion and then suddenly have great fights with it and throw it away from him just to turn around and carry it once again to his favorite area of his cage. 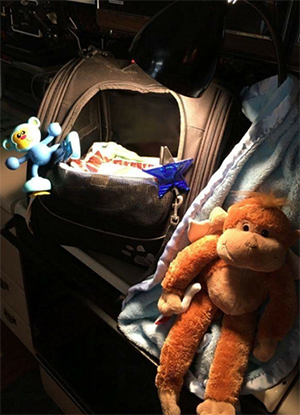 I continued to give him his colorful “Nuby” during the first years of him being with me, but found in his later years of life that he eventually did not need it any more, so I stopped placing them in his cage. During this time of his life on “Hospice-care” he now loved having his “Nuby” returned to him and be beside him. I think he really liked the extra company now that he could not see any longer. I did not see many changes during this time, except I did notice that he was not getting the exercise that he needed and that was because of the loss of vision that had changed him and the way he saw himself emotionally. He no longer had to be the king of anything, and it was our time to love each other and his time to allow me full control of his aging body. I remember thinking that together we had found the new normal, and he confirmed it often with me as I was holding him close in a nice warm blanket. I loved hearing his happy sounds when I had made him comfortable. Chewie seemed to want to be with me as long as he could possibly be and even though I knew that it would not be a long period of time, I also felt the same way. I knew that if I had a chance of happiness and acceptance after he left this earth, that we needed to experience this very sweet time together. I must also add here that he loved and wanted to eat and drink up until six hours. We both were at the stage of “complete and all encompassing love.” My ever waking moment was thinking about my little Chewie. He was always with me no matter what I was doing or saying. This also has been part of the reason I have learned to cope with my older family members passing away as well. I certainly was blessed to have two sets of parents (my parents and my grandparents) all lived to be in their late eighties. When I knew that their times to pass away were close at hand, I choose to become aware of them in a spiritual way because my grandmother had talked often about connecting with her mother like this when she was passing away. I remember being told many times in my early life that I had been a “special gift” in the lives of my family, especially in my grandmother’s life. My birth was the “returned love” that she had experienced five months after the terrible loss of her mother. I believe that Chewie and I always had a very strong spiritual type of connection but during the last six weeks he was with me, we grew much closer and bonded even more than I ever thought was possible. There were many gifts that came to us through being his “Hospice-caregiver.” He relaxed and accepted this care from me, which made it possible for us both to say good-bye to each other much easier. As Chewie’s leaving time grew closer, I knew that he and I had one more chance to spend a different type of time together. Instead of him being cross with me when it was time to bathe him or clean up his cage, he began to like his bath and being held by me once again. He even began to not be upset when my husband Bob came around me. His sweetness and ability to enjoy some of the things that he had lost desire for in his later life worried me at first because I felt that it would be even harder to say goodbye to him when it was time. Now that Chewie has been gone from my life for almost three months, I can say that having the special time with him at the end of his life was just absolutely wonderful. We once again were able to have sleeping time together, and his ability to respond to me so sweetly during our private times together, enabled me to have several private talks with him. I thanked him for choosing me to love and be his special human. I thanked him for adapting to all of the changes that he had to make when he first came to be with me. I thanked him for being so loving to me during all of the presentations that he chose to do. I thanked him for enjoying our trips and his travel cages. I thanked him for forgiving me for all of the times I was late feeding and watering him or for not keeping him perfectly comfortable and for of course, all the things that I was not aware were going on with him that might not have made him enjoy being in our world. I thanked him for being such a comfort to me during the year in which I lost my other monkeys Andrew, Polly, and Mitzy. I thanked him for never choosing to bite Bob. I thanked him for never choosing to bite me hard and make me cry. I thanked him for being such a good baby monkey-sitter for Silly Willy when he was a little tiny baby monkey. I thanked him for letting me experience his wonderful relationship time with Opie. I thanked him for staying so long with me after he lost his ability to move easily, or hear very well, or see very well, or eat very well because he lost so many of his teeth. 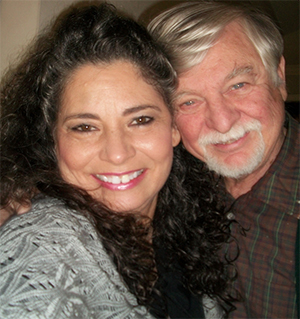 I thanked him for staying long enough to allow me to have the feeling that I knew I would be able to live without him. I thanked him for being here to help me learn more about being a better human. I thanked God for giving him such a peaceful passing and for me to be able to be with him when he did. I thanked God for sharing His Chewie with me and for using him to teach me more about love. Saying goodbye to Chewie was not easy but I am older and wiser now and I have learned more about turning loose of souls who I dearly love. I know without a doubt that there is a much larger plan going on with each and every soul that comes here. Being able to accept that I do not know the plans or have control over the outcomes of other souls life experience, has given me a sense of freedom and has given me the ability to accept things much more easily that I know I cannot change. It has also helped me to be a much more forgiving person to myself and others. The life change centered around the loss of Chewie, and the actual missing of him is still extremely hard. We were connected in a very personal and special way. 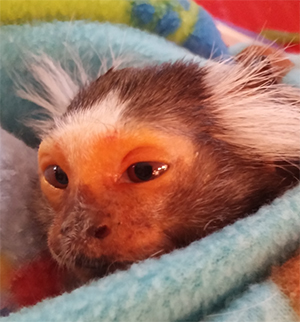 My experience with him has been totally different from being the caregiver of the capuchin monkeys which is very natural due to the difference in the type of monkeys that they are. When you have a monkey that becomes only your monkey, it is very hard to say goodbye. My relationship with Chewie was a powerful spiritual connection, which became stronger each and every day. I will forever be thankful for our time together and I know I will be with him again. Losing a monkey at any time is unbelievably hard to cope with emotionally, just as it is with the loss of our other animals, friends and family members. The monkeys seem to have an ability to bring out so much love in us humans. When we understand about the power of love that we can experience with our loved ones, and how it is offered to us over and over again in our lifetimes, we begin to know without a doubt, that more LOVE is always on it’s way. Thank goodness these words represent truth for me to believe in. I miss Chewie and I know that I will miss him until the end of my life.